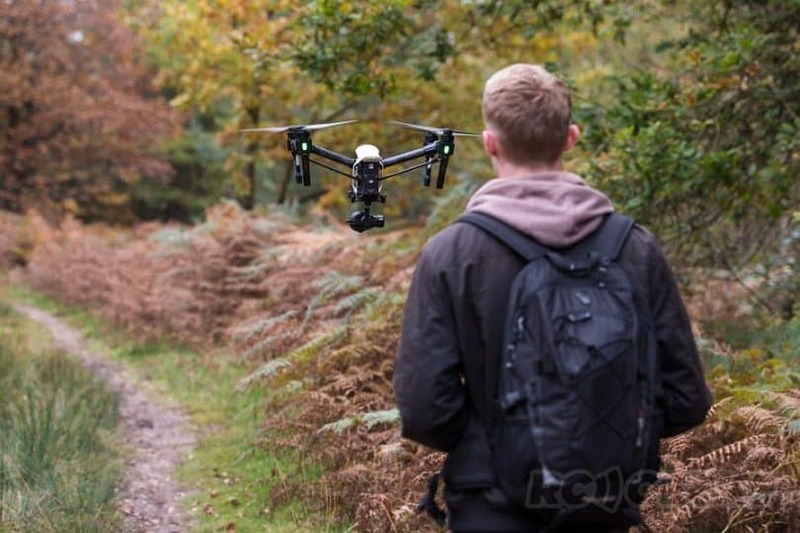 The DJI S900 is an impressive drone that you can use for filming all sorts of things. You can get a proper camera attached to the bottom of the drone and it is light in weight and strong enough to be easy to pilot anywhere. Notice: The DJI S900 is an ARF, or Almost Ready to Fly, model, meaning that you will have to put together the drone before you can use it. You must be precise as you need to get the cables for the drone assembled the right way while also fastening each individual part. To be more familiar with the drone kit assembling process, you can read our article about building your own kit drone, and, you can likewise look at how the assembly process for the DJI S900 works by checking out this video. 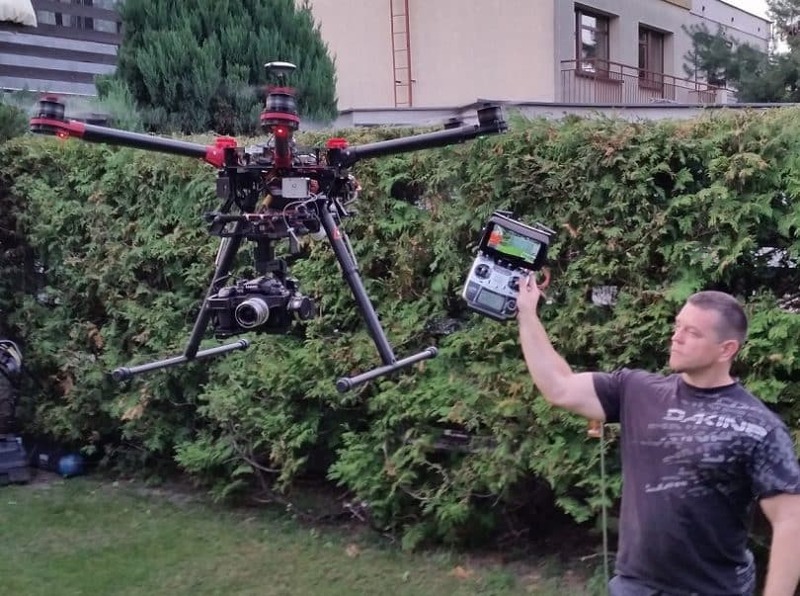 After it is put together, the DJI S900 will be easy to pilot. You can use this to take pictures and videos from well off in the sky. It is amazingly easy to start up and land thanks to its retractable landing gear. As it gets in the air, you can move it in a variety of directions with ease. Additional details: As efficient as the drone can be, you will have to get your own separate camera ready for use. You must also make sure a proper wireless connection is available to allow you to view the camera in real time. New and improved motors makes for a much more reliable flight. Improved power distribution system and better footage using dampers to separate the mainframe with the gimbal bracket. Retractable landing gear makes every great shot possible. Also, some RTF or Ready-to-Fly versions of the DJI S900 may be available through some retailers. It will cost a substantially higher amount of money though as retailers can charge hundreds of dollars more for an RTF version than they would for an ARF model. No matter what you order, make sure you look carefully to see that your model is built with the best possible materials. The DJI website may be the best place for you to order the drone from if you want to make sure that your drone will be made with only the right and most functional materials. To make the drone look sleek and professional, the body is painted with a strong black color. However, there are a few red accents placed around the drone as well. In terms of durability, the DJI S900 is made with a series of strong engineered plastic components designed to keep the drone from breaking apart while in motion. The arms and landing gear are made with carbon fiber materials which are light in weight but dense enough to where they will not crack apart. It also makes it so the drone will be easier to control as heavier models tend to be harder to fly. The landing gear is 460mm long, 450mm wide and 360mm high. This allows for enough clearance for the drone while still establishing a strong arrangement where the drone can move about as necessary. 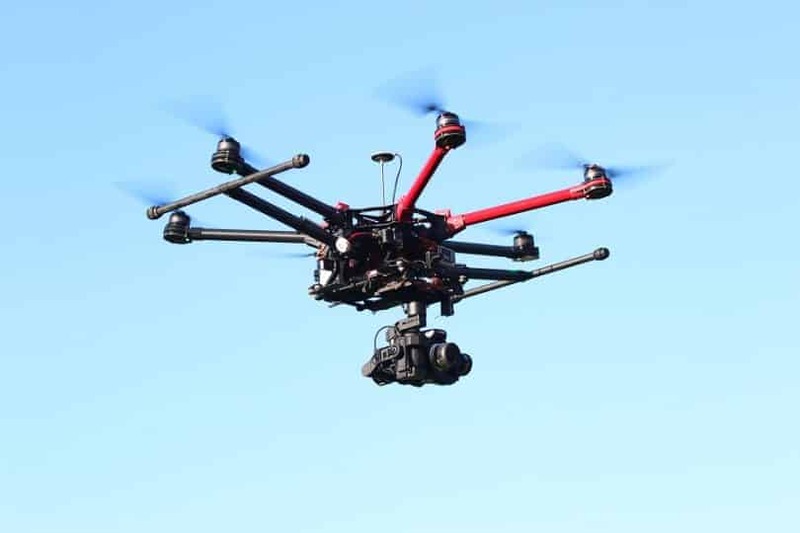 All six arms on this drone are spaced out evenly from each other – this ensures that the drone will be easier to control as it will not favor any particular sides. The center part of the drone is made to house the main control and power mechanisms and it is carefully guarded by a sturdy center frame. This part of the drone is also what is used to help with getting a camera attached to the bottom part of the drone. The 500W motor setup is strong enough to help you get the drone up and running and each motor is about 158g in weight. Each comes with its own cooling fan to help you start it up and keep it under control. Also, the cooling fans will keep the motors from overheating during flight. The propellers are made with strong engineered plastic materials and they can be folded inward as necessary. These are 15×5.2 inches in size and weigh about 13g each, thus keeping them from adding too much weight. The propellers are also carefully labeled so you can easily tell which ones are to be installed properly. You will have to provide your own camera when using the DJI S900. The center frame offers a mounting feature that makes it easy for you to get a proper drone filming setup. A brushless gimbal is used to allow you to secure a 4K camera. Specifically, you can use this with a DJI Z15, Z15-BMPCC, Z15-GH3 or Z15-GH4 gimbal onto the drone. The types of cameras that you can fit onto these gimbals will vary based on the option you choose. 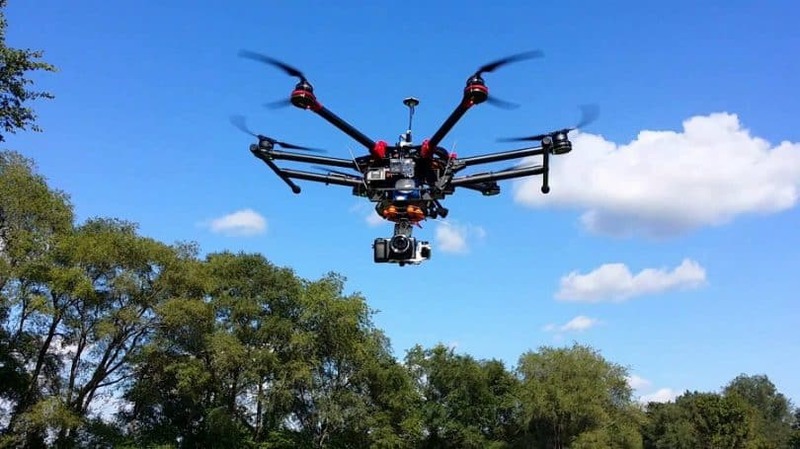 If you want to find out more about camera gimbals for drones, as well as learn which models are the best, we suggest checking out our article about the best drone gimbals. 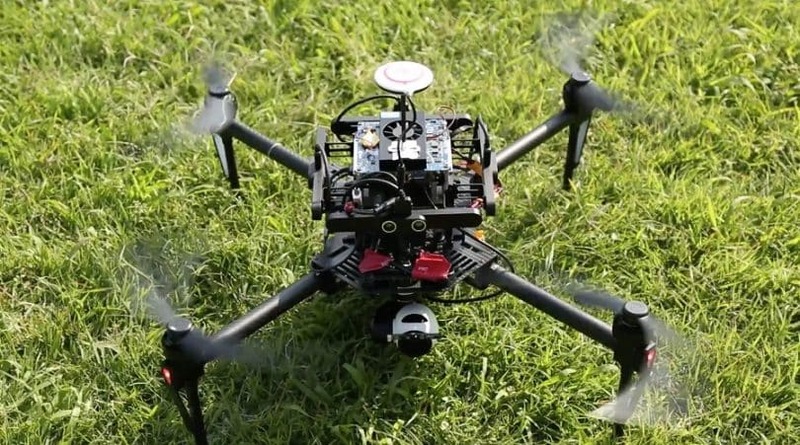 The DJI S900 will work with a Li-Po battery. You can use a battery from 10,000 to 15,000mAh as the drone can use up to 3000W at a time with a hover power consumption rate of 1000W. 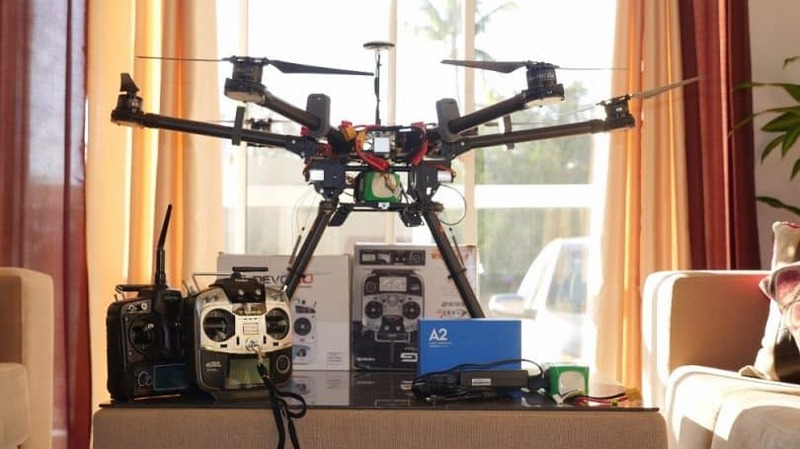 The flight time will vary based on how much capacity is in your battery and the weight of the drone as it takes off. For instance, a drone with a 12,000mAh battery with a 6.8 kg takeoff weight can hover for about 18 minutes on a full charge. The drone does not come with its own controller since it’s ARF most of the time. 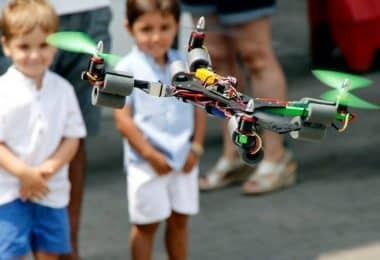 That’s why we recommend an A2 flight controller to create a stronger connection that makes it easier for you to adjust the drone while in the air. The A2 controller will especially link to traditional receivers. The A2 controller, which is made by DJI, works with a six-axis control setup. 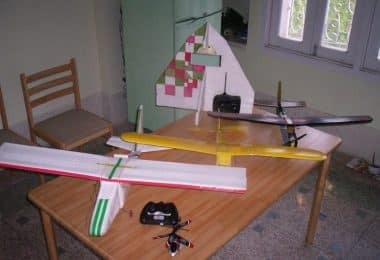 It works with a maximum tilt angle of 35 degrees and can control the ascent and descent of the drone at a rate of up to six meters per second. This can especially support a two-axis gimbal that you can fit onto the drone yourself. It can handle a position hold feature. This is where the drone will hold its position in the air. An altitude hold feature is also included. This means that the drone will not move up or down while moving. 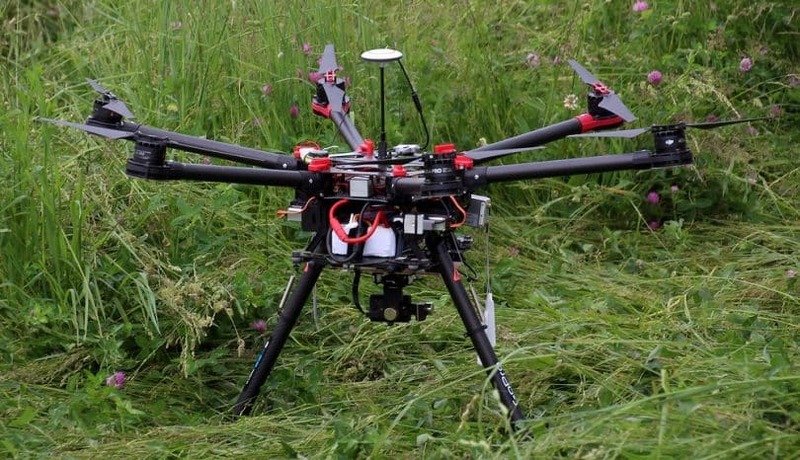 An automatic landing feature is supported to help allow the drone to land on its own. A return to home feature is also included to identify the location that the drone started up at. This allows the drone to move back to that location if it loses signals or runs out of battery power. This can all work with a receiver that is capable of handling all of these features. Be sure to check on what receivers are available and if they can support the controller that you want to use when flying this drone. The DJI S900 is a strong overall performer in the air. It can weigh from 4.7 to 8.2 kg on liftoff depending on the battery being used and the camera. This can hover for at least fifteen minutes on average. This can move at a speed of up to 16 meters per second or 36 miles per hour. It can carry about 4,900 grams or 10.8 pounds of weight without any hindrance. The ascent and descent speeds are about 6 meters per second each. This can operate at conditions from -10 to 40 degrees Celsius or 14 to 104 degrees Fahrenheit. DJI currently sells the DJI S900 on its own for $1,400. This is for the general base and the key parts needed to make it work. You will have to spend extra to utilize the controller and gimbal for the unit. 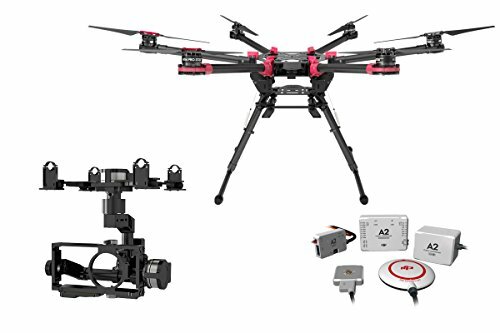 In particular, DJI sells an S900 model that comes with the A2 controller and the Zenmuse Z15-GH4 gimbal for $3,100. Still, you will still have to supply your own camera to use with this although it should be rather easy for you to get a proper camera added to the gimbal to make it work right. 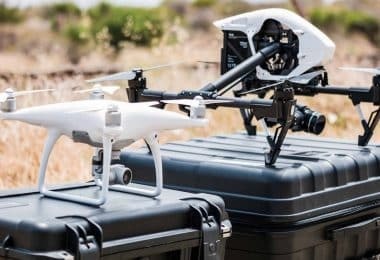 DJI has not specified if there is a particular guarantee on the product in terms of whether or not it will work to one’s needs. It is best to contact DJI to ask about such guarantees or if there is a return policy that allows you to return the drone as needed in the event that it does not work as well as you might have hoped. This is a drone that offers a great variety of options for you to choose from when it comes to making it work. You have the option to choose whatever gimbal, camera, and controller you want to work with. You should at least be certain that these three items are compatible with the model that you are ordering though. This is to ensure that you can get it up in the air without any problems. The gimbal bracket is especially designed to be separated from the rest of the main frame. This works with a series of dampers that will separate it properly. As it is used properly, it lets the camera attached to it move around freely and with less obstruction. One particularly appealing feature comes from its folding arms. You can fold down the arms on this drone when it is not in use. They will fold inward toward the center so you can store the drone in a secure spot for later use. 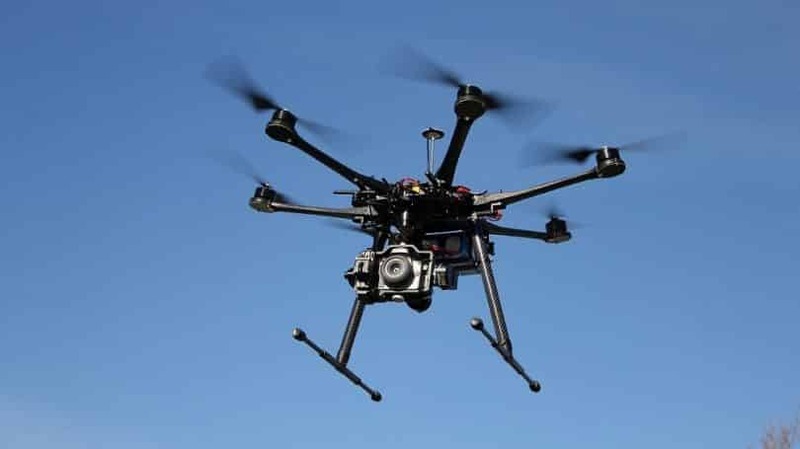 The drone arms will not wear out and the connections will not be hurt when used properly. You can also use the DJI Lightbridge 2.4G HD video downlink system with your drone. This can link your drone to a compatible on-screen display that might work on a proper receiver. This allows you to look at what your drone is shooting in real time. Depending on the receiver you use, you might be able to control the position of the camera, its zoom features and even take still images if desired. The Inspire 1 Pro, which is also made by DJI, has four arms with their own motors and propellers. This can operate at a distance of up to 5,000 meters. It also has a similar battery setup that can last for around 15 minutes at a time. An important difference is that the Inspire 1 Pro has a gimbal that is closely built into the drone. This is a little easier to manage as you don’t have to get a separate drone from another provider to make this work. Still, this is a feature that should be checked based on how well it might work for you. In addition, the Inspire 1 Pro allows you to adjust the camera while on the fly. With the S900, you have to adjust the camera on the ground before it takes off. The Inspire allows you to adjust the exposure and shutter speed within the camera while in flight. This will provide you with more control when you’re trying to take good pictures with the camera. For much more information about this model, take a look at our DJI Inspire 1 in-depth review. The S900 battery does last for a slightly longer period of time, though. The battery on the Inspire can only work for about ten minutes on average with even less power if there’s too much weight on it. Another option from DJI is the Matrice 100. This also operates at up to 5,000 meters but the biggest point about this is that it has support for a stronger battery. In particular, the battery on this one can last for about 40 minutes on a single charge. Part of this is thanks to how the battery cage for the Matrice 100 is a little larger in size, thus supporting the use of a much larger option. One interesting part of the Matrice 100 is that this, unlike the S900, can link to the Oculus Rift virtual reality headset. You can use this to control the camera gimbal by moving your head. This allows you to adjust the camera position in real time while the drone is up in the air. This adds to the control that you will get off of this model. For a better insight in what this model offers, check out our DJI Matrice 100 review. In addition, the housing in the middle part of the drone is secure enough to where the battery will not be easily exposed. This allows the battery to keep on working for more time without being at a real risk of causing any harm to the drone in general or making it wear out fast. 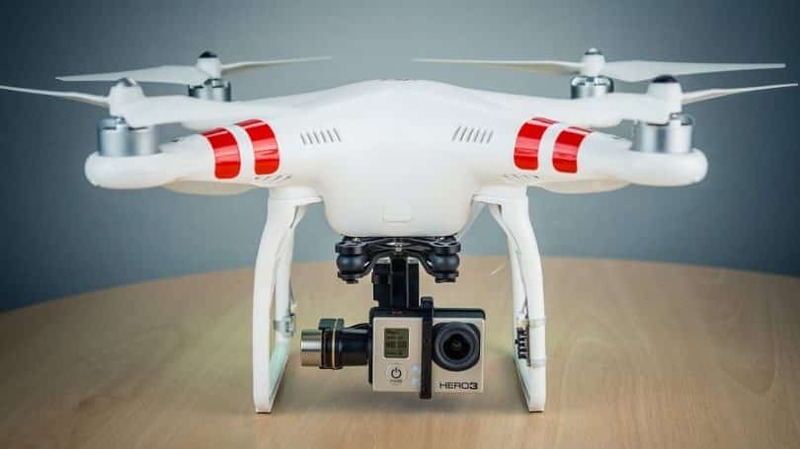 The last quadcopter to compare the DJI S900 with is the Phantom 2. This model only has four arms versus the six on the S900. However, the 5200mAh LiPo battery offers a greater amount of flight time as the Phantom 2 can go for at least 20 minutes at a time. To get more familiar with flight time and performance of this model, we suggest checking out our DJI Phantom 2 in-depth review. The gimbal for the camera is not installed on the body with the Phantom 2 just like with the S900. However, it is very easy to install the gimbal on the Phantom 2. It takes about 30 minutes to get it ready with this model. Still, the gimbal that comes with it must be used; you will still have the freedom to choose any gimbal of your liking when you use the S900. The three-axis design is slightly smaller than what the S900 uses in that it does not work with as many in-air controls as the S900 can handle. The Phantom 2 can still work with an effective series of yaw, pitch and roll controls. The frame on the Phantom 2 is a little thicker as well. 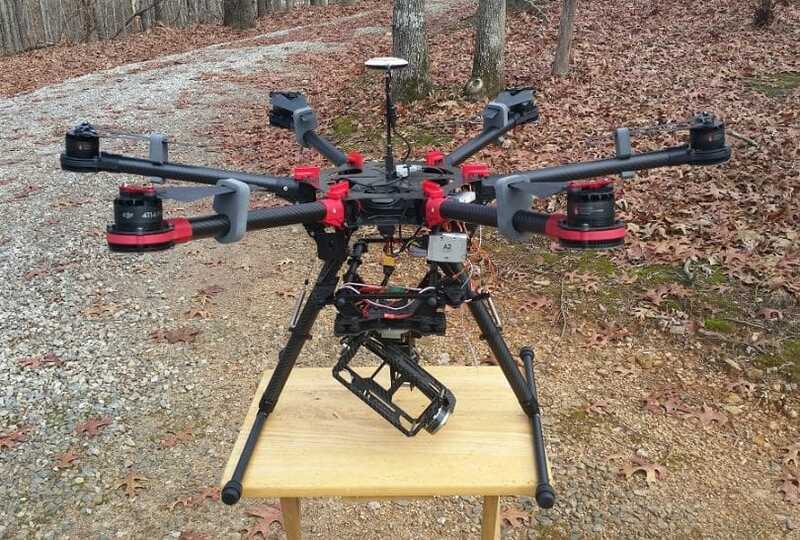 In fact, the entire drone weighs close to 9 pounds when it is fully setup. This is without the camera on the bottom. This drone can be challenging to set up on your own, what with there being so many parts. However, the process of getting it ready will certainly be rewarding thanks to the freedom to choose from a variety of different parts to use when getting this ready. This can work with a variety of attachments to help you get a camera set up. The drone has an even body in terms of how its motors are organized. This allows for a clean and easily controllable flight. The landing gear can be programmed to move up and down. This will allow for a comfortable landing on any surface as well as a good base to lift it off with. You can choose from many batteries and controllers for your drone. The carbon fiber materials are light in weight and yet will create a strong body that will not break apart when it runs into anything or has a tough landing. You will have to get this assembled on your own to ensure that it works properly. Not all gimbals and controllers will work with this drone. Check the parts as you set up the drone to determine if any controllers or gimbals you want to use are compatible with the S900. The DJI S900 is a brilliant choice to look when looking for a photography drone. The DJI S900 is clearly a drone that was made for photography purposes and for those who want something a little more technical. This is a high-end option that is strong enough to get out there and up in the sky with ease. Meanwhile, it is powerful enough to where it can stick on its place for a while. When used properly, it can get up in the sky and take some of the best pictures you could ever experience. This drone is efficient and unique while also being easy to customize based on the parts that you might add to it. It will especially be a great choice if you’re looking for a model that you can set up and use on your own.